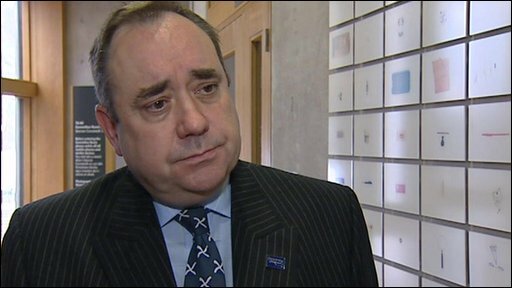 Alex Salmond described the search for survivors as "extremely bleak"
The chances of finding survivors from a helicopter which crashed in the North Sea off Aberdeenshire are fading, Scotland's first minister has said. The bodies of eight people have been recovered after the Bond Super Puma came down about 15 miles of Peterhead, at about 1400 BST. Alex Salmond said the outlook for the remaining eight people on board the helicopter was "extremely bleak". The coastguard said the search would continue despite fading hopes. Susan Todd from the Coastguard told a media conference in Aberdeen: "We are now at the extreme of the survival chances for people wearing the suits that they would have. "We can never discount the will people have to live and we will continue searching." She said the conditions in the North Sea were "excellent" and "very benign" at the time of the crash. The helicopter was returning from BP's Miller field, 168 miles north east of Aberdeen, when it crashed. The first minister said: "It looks like we might be might be facing the second worst helicopter support incident in history, in terms of the number of fatalities. "Eight bodies have been recovered and I am afraid to say the outlook for the other eight people involved is extremely bleak." Brian Taylor of the drilling contractor KCA Deutag said he believed ten of his crew were on board, nine from the UK and one from Europe. Helicopter operator Bond confirmed one of its aircraft was involved in the latest incident. It carried 14 passengers and two crew. Bond representative Bill Munro said the company had "every confidence in the Super Puma family", and that its 700 helicopters working worldwide had an "excellent safety record". He said he had no information to suggest a mechanical failure on the aircraft, and that it was "far too early to speculate" on the cause of the tragedy. Offshore union RMT called for the grounding of the model of helicopter involved in the crash until it was clear what caused it to come down. Offshore organiser Jake Molloy said: "Reports indicate that today's crash was the result of a catastrophic failure in the aircraft and it would make sense for the model involved to be grounded until it is clear what caused it." The crash comes less than two months after a Super Puma helicopter with 18 people on board ditched in the Etap field 125 miles east of Aberdeen. All those on board survived the crash on 18 February. A major rescue operation was launched after the latest crash. The helicopter issued a mayday which was picked up by air traffic controllers. Eight bodies were later recovered from the water by the support vessel, Caledonia Victory. It was making its way back to Aberdeen Harbour. Grampian Police said it had "increasing and grave concerns" for those still missing. Prime Minister Gordon Brown said: "This has been a tragic day in the North sea and my thoughts are with the relatives of those who have lost their lives in this crash. "It is at times like these that we remember the risk and the dangers that people have to undergo working to meet our energy needs. "My thoughts are with the families and my thoughts are also with those who are doing their best to deal with the consequences of this crash, all those in our hospital services and all those who are on sea and on land trying to help those who have been under difficulty." The Queen sent a private letter of condolence to the families of the victims. The words of comfort will be conveyed by the Lord Lieutenant of the City of Aberdeen to the families of lost loved ones, a Buckingham Palace spokeswoman said. An emergency telephone number has been set up by BP for concerned relatives - on 01224 836479 .